Ready to get holiday baking? Good, me too! It’s one of my annual traditions. 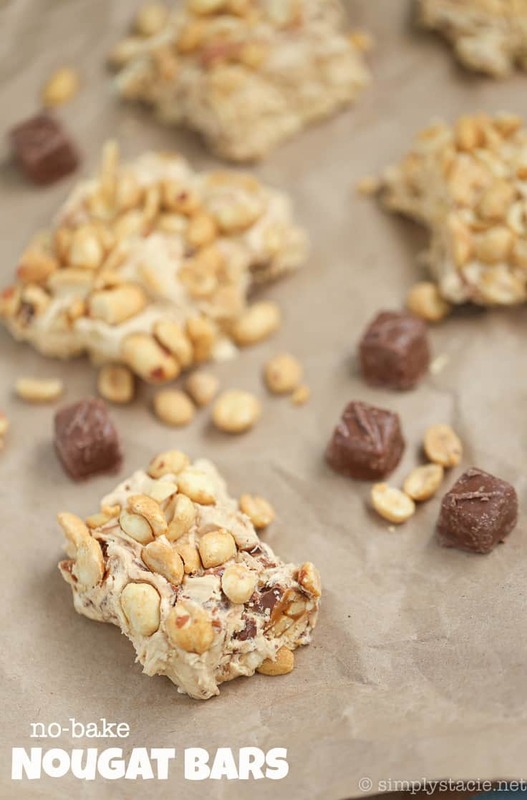 Every year I make several of our favourite sweets (these No-Bake Chocolate Peanut Butter Haystacks are a family fave) as well as trying some new recipes. The easier the recipe, the better. I’m the queen of no-bake desserts! One year, I went all fancy (at least in my world) and made a variety of desserts that required a candy thermometer. They were yummy, but time is precious and maybe I’m a bit lazy because I’ve never felt the desire to make them again. That’s one reason. The second is that I ruined a pot making fudge…let’s not go there. 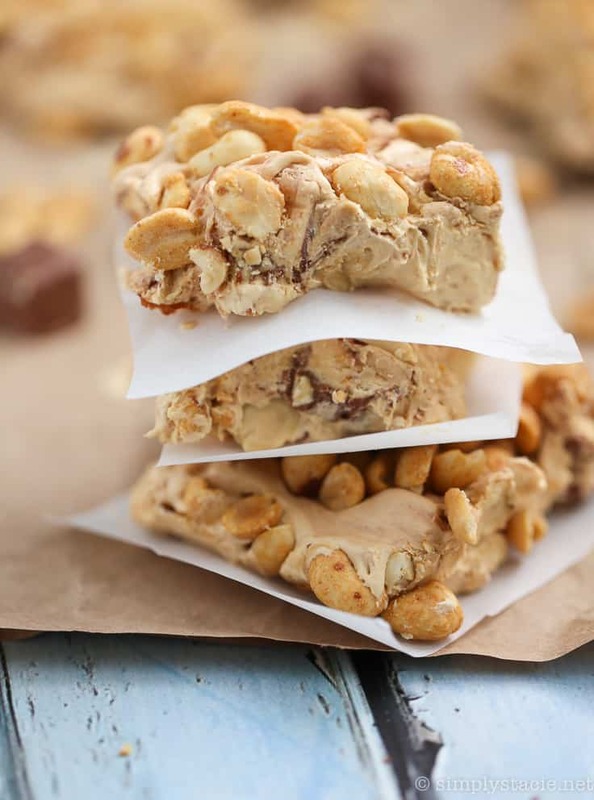 These No-Bake Nougat Bars will not ruin pots nor do they require any baking. Unless you count using your microwave which I think technically doesn’t count. They remind me of the nougat you’ll find in a chocolate bar like Snickers or Oh Henry. They also have Snickers Bites in them. The recipe star is definitely the peanuts. These squares are PACKED with peanuts. I used the dry roasted variety, but any kind that you have on hand will work. Honey roasted is also tasty. This recipe uses an entire jar of Fluff! If you don’t have Fluff where you live, look for a marshmallow creme. It’s usually found where the ice cream toppings are at the grocery store. We always have a jar of Fluff in our pantry because John likes his Fluffernutter sandwiches. He wasn’t too happy about me using an entire jar from his stash. He’ll get over it though. One thing to note is that this dessert is very sticky! What’s up with me lately making all these sticky desserts? I swear I didn’t plan it that way. Anyways, keep some wet wipes near the dessert table if you serve this at your holiday parties. The taste makes up for the messy fingers. Do you make any no-bake holiday treats? If so, do you keep them for your own household or do you share them with friends and extended family? 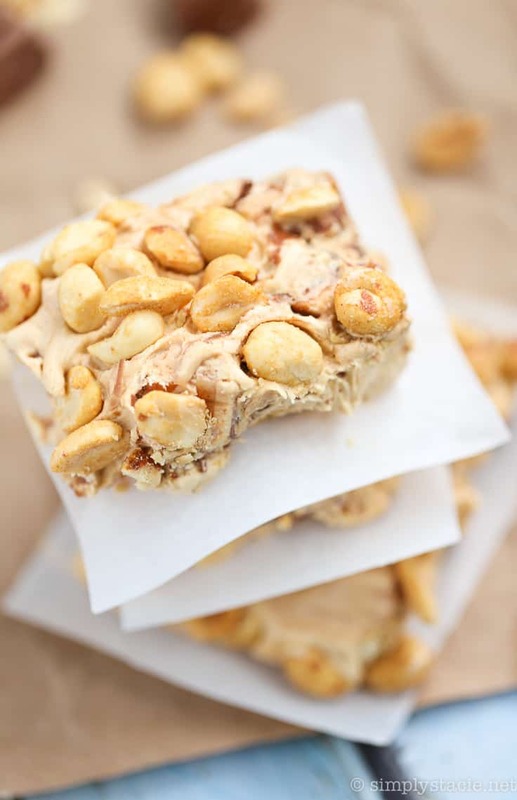 Prepare for a sticky sweet explosion with this No-Bake Nougat Bars recipe! Only 6 ingredients. I make this recipe every Christmas. Grease a 9×13 baking pan with cooking spray. I also lined mine with parchment paper so it would be easier to remove (and clean the pan!). Spread 1 1/2 cups of peanuts on the bottom of the pan. Set aside. In a medium sized bowl, add peanut butter chips and butter. Heat in the microwave for 1 minute at medium power. Stir. Heat again on medium power for another 20 seconds. Stir. Continue to reheat at these intervals until mixture is melted. Be careful to not burn it though! Mine melted after I stirred it together. Pour in the can of sweetened condensed milk and stir to combine. Heat in the microwave for 1 minute on high. Stir in Marshmallow Fluff and Snickers Bites. 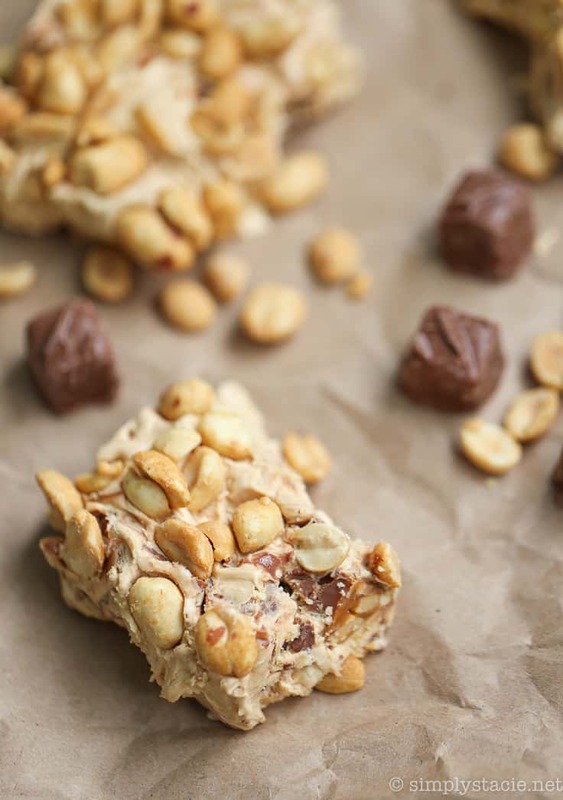 If you can’t find Snickers Bites, grab a few Snickers chocolate bars and roughly chop. Pour mixture into baking pan. Sprinkle with the remaining 1 1/2 cups peanuts. Refrigerate for 3 hours or until set. Cut into squares. Love no bake during this hectic time of year! 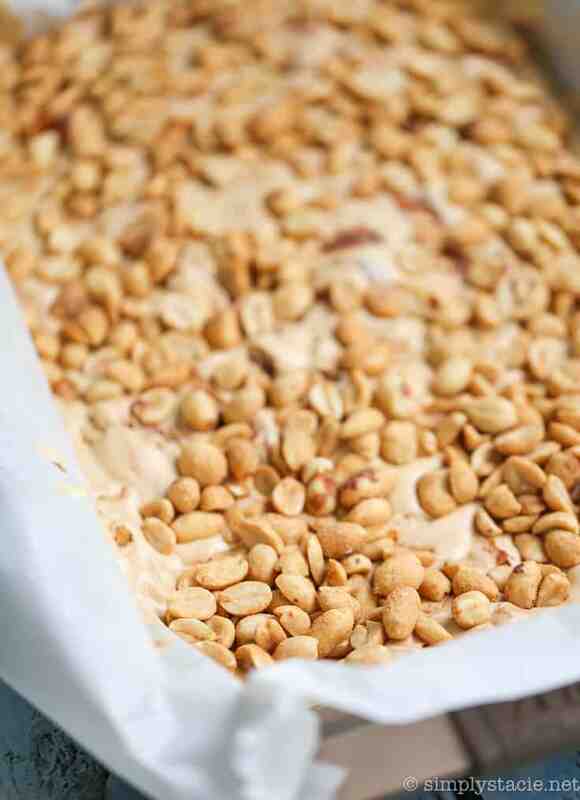 I love this recipe for No-bake nougat bars. I plan on making them and have saved them to my favorites. I usually make fudge and chocolate balls. I share with my family and they look forward to these goodies. Yep, that looks amazing! Pinned! Oh my this looks good and easy to make! no baking required?! I’m in!! These look so easy to make and look yummy! I like how pretty they look and the ingredients in making these nougat bars are incredible. I love no bake treats. 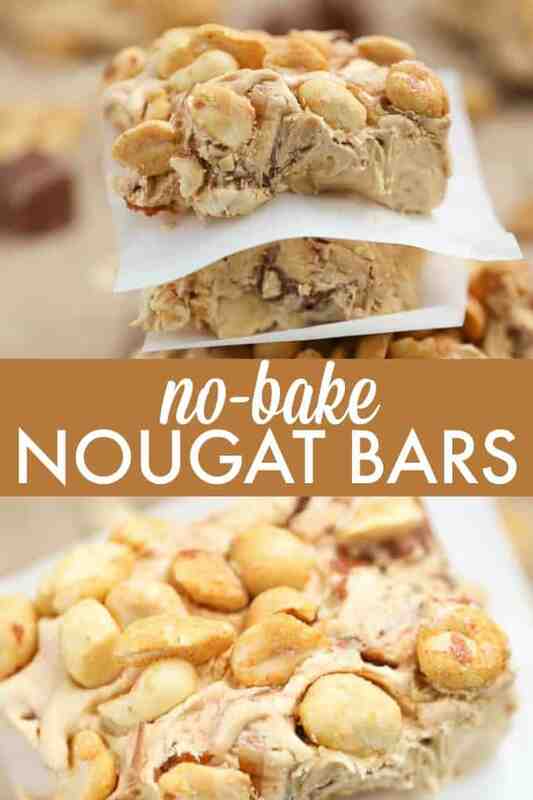 Have not had nougat in years, will have to try this recipe. Thanks for sharing it. 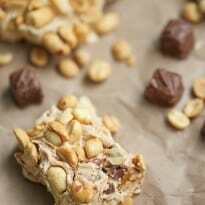 Thanks for a no bake treat, other than being real sticky these sound amazing, and I bet they would also be awesome with honey roasted peanuts, yummm!! I’m adding this to my “must make” for my Crhistmas baking trays! It looks delicius and easy, too, which is exactly what I need because I’m cramped for time! Oh my goodness Stacie. These look absolutely gorgeous. I know it was a while ago, but I want to thank you for linking this recipe up to the Thriving on Thursdays linky party. I’m starting it up again tomorrow for 2016 and just want to let you know that I’m featuring this post. Hope to see you again in 2016.